Lead a colony of climate disaster survivors. Exploit and develop technology in your hands to improve your infrastructure, production and research. Construct new buildings and platforms to expand your city. Specialize your colony, trade or go for self-sufficiency. Explore and rescue valuable remains from the civilization of the 21st century. Reuse components from the past, and craft unique items. 5. Download & install Update: v1.1.8, in game folder. • You can access Key Binding information by pressing F1 or, in the System Menu, click on the option Key Binding. 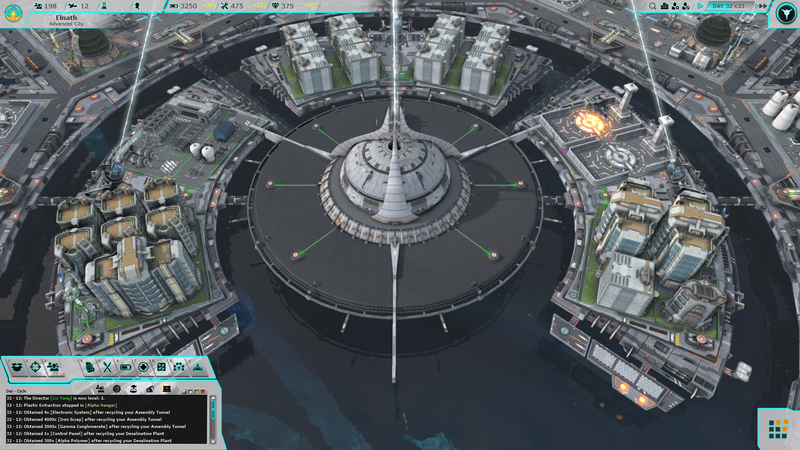 • The Govern/threat panel is now more intuitive on how to assign resources to counteract your colony's threats. • A new shortcut is available to Autofill your Organization Chart by pressing: F. (Check the Key bindings for more info). • To avoid issues, Quickload(F9) option is now disabled while doing the campaign or the tutorial. • There is a new Industrial technology available to track rare metals (silver, gold, platinum). It is still subject to rebalance. • Magenta Innovation points produced by ships has increased significantly. • The amount of Alfa Prefab obtained with the Construction Packing (the one you can choose on game start) has been increased from 1,000 to 1,200. • We continue improving the game performance and memory issues hopefully should be gone already. • The chance to produce invention docs while researching colored docs in the Labs and Corporate Buildings has been increased from 20 to 40%. • The Pumping Tower was sometimes “fishing” wrong-quest items. • Solved an issue with log error messages when changing message priority. • Corrected typos reported by the community. There is a new update on German and Chinese languages. Special thanks to lord.herbo and Benny for their latest updates!! *Currently only the tutorials are available in Chinese language. • Startup SC (Synthetic Coins) have been increased, specially for lower difficulties. • There are new items available at the market. • Fully filled maintenance/comfort toolkits will be craftable in the Workshops. • It is possible to craft Core Invention Docs from your Corp Buildings with 1 Core Doc of its color + 5 Invention Docs. (Require Cosmos' Tech: Invention). • The probability to find Tin has been slightly increased from 4% to 6%. We agree with the community feedback about it being a potential bottleneck. • Botanic Gardens innovation production has been slightly increased. • Panels having sub-panels will now remember state and position, hopefully saving you some clicks. 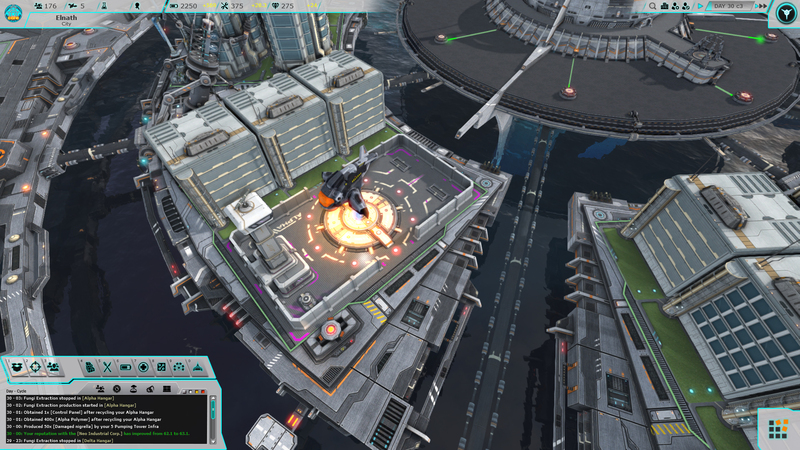 • Hovering mouse on buildings node-connectors will show the required blueprint and its color. • Health scoring values (in the score panel) will be now rounded, so having your colonists average stats to 95 or higher will give you 10 points. Before you needed your colony’s average stats to be 100. • Audio volume for the NPC notifications has been slightly reduced. • Added new in-game-tips about technology and keyboard shortcuts. *In case you disabled your in-game tips, it is possible to re-enable them through the Options menu. • Resources guide has been update to the current patch. There is a new update on German, Russian and Chinese languages. Special thanks to lord.herbo, Dorado and Benny for their latest updates!! *In the coming days, the German language will figure in the store front page as fully translated. 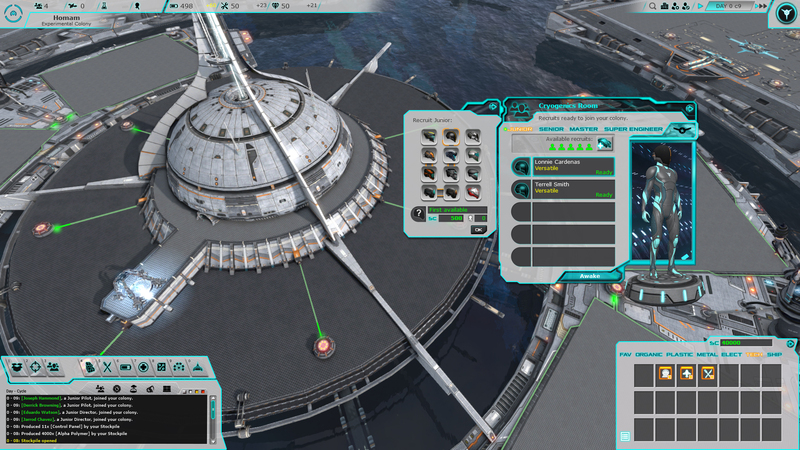 • Quests to promote a Super Engineer in your colony and to develop a Core Technology to level 6 were spawning too early. There is a major update on the Chinese language. Special thanks to Benny for his last update!! • We have removed the affinity requirement for items in the market. *Before this patch, some items were only available in the market if you picked the corresponding affinity. • Solved an issue preventing to build a second Corporation building on the same platform. • Residential buildings were displaying wrong information regarding their blueprint color. • Solved an issue with UNICODE fonts when displayed in multiline text widgets. There is a new update on the Russian language. Special thanks to Dorado for his last update!! • The amount of climate threats on low difficulty levels have been reduced. • Assembly Tunnels and Greenhouses will produce now more innovation points. • Too many colonists dying in your colony may bring “Desolation”, which is a social threat you must resolve in time or desertions will start happening in your colony. We have rebalanced the desolation threat so it will need a higher amount of dead colonists to be triggered. • Very bad reputation with a Corporation may trigger sabotages in your colony. These sabotages are less likely to happen now. • It is now possible to disable threats without the game auto-setting itself to low difficulty.